It happens sometimes. Your diapers will stink and I don't mean because of the present your baby left inside for you to deal with. Here's some of the common reasons your diapers may stink and how to solve your problem. This is used to describe cloth diapers that smell bad despite being clean. Switch detergents - your detergent may not be doing a great job. Decrease the amount of diapers you wash at once. If your load is too big, your diapers will not get clean. Diaper Pail Ammonia: if your diapers doesn't wreak of ammonia after you change your baby, but you notice the smell after they've been in the diaper pail, this is common! If this is your problem, you'll want to wash more often and rinse your diapers before throwing them in the pail. Diaper Change Ammonia: if you can't change your baby's diaper without being blown away from the ammonia smell, you need to strip your diapers! The ammonia can cause burns on your baby that are very painful, so it's important to treat your diapers. You'll want to start rinsing your diapers before throwing them into the pail, especially nighttime diapers. If you have hard water, consider adding Calgon to your wash routine. Make sure your detergent is rinsing out of your diapers in your wash routine. You may need to decrease the amount of detergent you use. 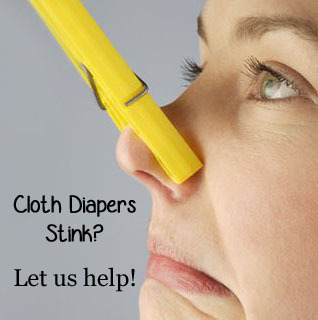 Have you been battling cloth diaper stink issues? Have you tried any of the tips above? Please share!